Discussion in 'Air Force' started by Costas 240GD, Jul 5, 2006. Looks even more comical than the old Z8? A variant of the civil AC313 ... AFAIK called Z-8AWJ, but I could be wrong. Looks shmooks the damn thing flys that's what's important. Yodello, AleDucat, Josh Luo and 8 others like this. AleDucat, Josh Luo, kenvui and 10 others like this. mr.bean, Dolcevita, N00813 and 6 others like this. 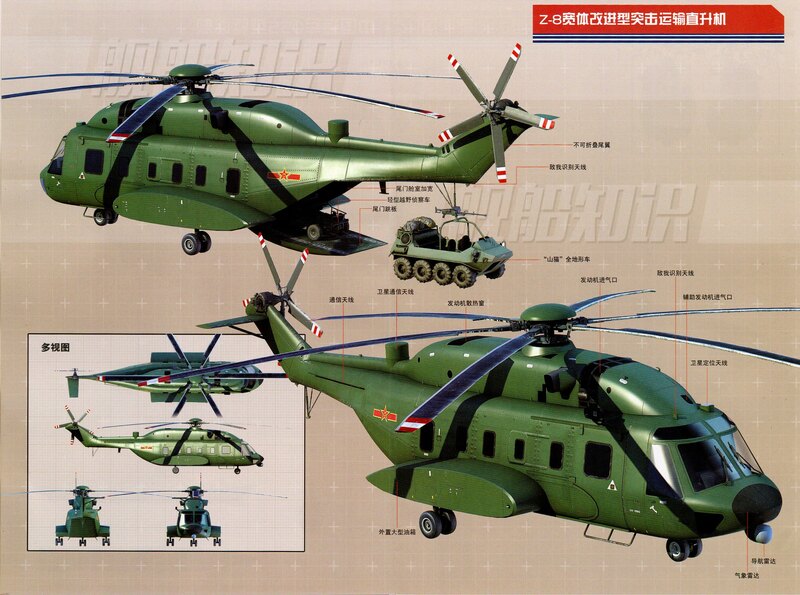 I really don't understand why this - in fact new helicopter - is still labelled a Z-8 variant. mys_721tx, by78, duncanidaho and 3 others like this. Common engine and propulsion components? Some hold over of requirements? Easier to get approval for? Some General really likes the way it rolls off the tongue? The Turbomeca Turmo IIIC engines belong in a museum. AleDucat, mr.bean, Hyperwarp and 6 others like this. Offical media: Chinese new aerotransport "Yun-9" will be operational soon.